Great papers and I love the banner! I love the colors and the stitching on this card! Really pretty! pretty card! great papers, lovely colors. Beautiful card! I love the sentiment on it! Beautiful card. Love the combination of pattern paper. Great card! 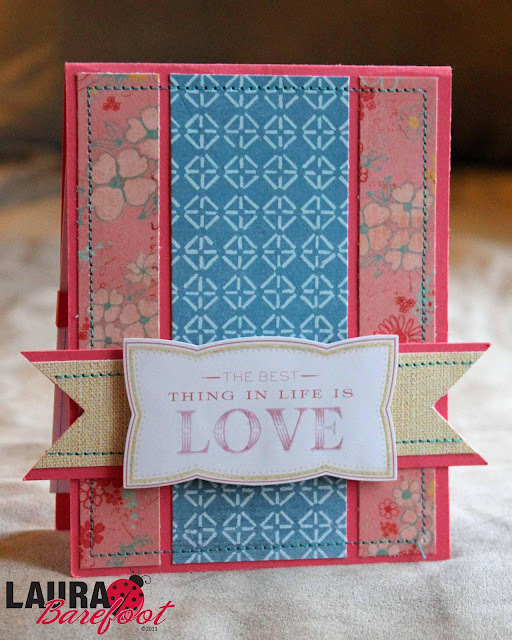 This is gorgeous.. love the colours, layout and the stitching is just perfect! I love this card! Lots of detail and nice color. PC was crazy not to use this one. OH! Great colors and sentiment! Came over from the link on Moxie Fab! :) Congrats on being Moxie fabulous! Gorgeous! Love the banner strip behind the sentiment and the pop from that blue vertical strip! This is a great take on that sketch! I can't even begin to imagine why this card did not make the cut...it's wonderful!!!! beautiful card, I love the sewing on it. Congrats on being Moxie Fab! Love your use of the fun banner.